A fire engulfed a Serra Mesa apartment complex Thursday afternoon, but injured no one, a fire official said. Photo via OnScene.TV. A fire engulfed a Serra Mesa apartment complex Thursday afternoon, but injured no one, a fire official said. 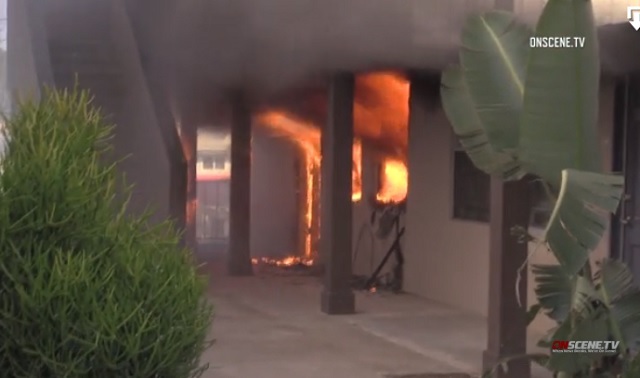 The fire broke out around 1:20 p.m. at an apartment building on Ruffin Road north of Mission Village Drive, according to the San Diego Fire-Rescue Department. SDFR spokeswoman Monica Munoz initially said two units — one on the first floor of the building, the other on the second floor — were involved in the blaze. It was later determined that another two units were also damaged. The fire was knocked down about 20 minutes after units arrived, she said. No one was inside any of the units at the time of the fire. Two adults and two children were displaced from one apartment, and two adults and two pets were displaced from another, Munoz said. It wasn’t immediately clear who lived in the other two apartments — fire officials weren’t able to find them, according to Munoz. There was no information on the cause of the fire or the cost of the damage to the building.